You've been asking and now it's finally here -- a glass bottle for adults. At 22 oz. with a widemouth opening, the Lifefactory glass bottle is perfect for adding ice, a slice of lemon and your favorite beverage. Moms and dads need to stay healthy too! Widemouth bottle make it easy to add ice, citrus slices, tea bags, etc. Lifefactory 22-ounce (650 ml) reusable glass water bottles offer a large capacity to quench a big thirst while providing an excellent alternative to disposable plastic bottles. These innovative bottles feature durable glass construction that offers pure taste with no chemical leaching. The bottle’s glass is surrounded in a patented silicone sleeve that both protects against breakage and provides a comfortable, non-slip gripping surface. The bottle also features a wide-mouth opening making it easy to fill with ice cubes, pieces of fruit, or drink mixes and powders. The Classic Cap offers leakproof security. The cap screws on tight to the bottle and a silicone gasket creates a positive seal to lock liquids in. The Classic Cap has a carry handle on top that makes it easy to tote the bottle. For easy care, the silicone sleeve and bottle can be washed together. 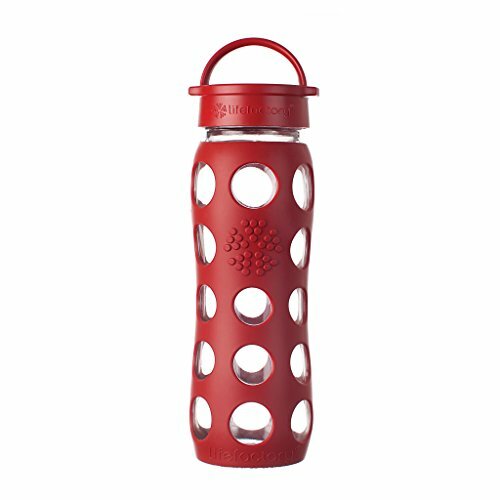 All components of the bottle are dishwasher safe. It is recommended to wash the cap on the top rack. The cap is constructed of BPA/BPS-free polypropylene (PP#5) with no phthalates, PVC, or polycarbonates. All Lifefactory components are made in the USA or Europe and all products are assembled in the USA.